DUMBARTON snatched a draw from the jaws of victory at home to Montrose — and slipped to second bottom of League One. 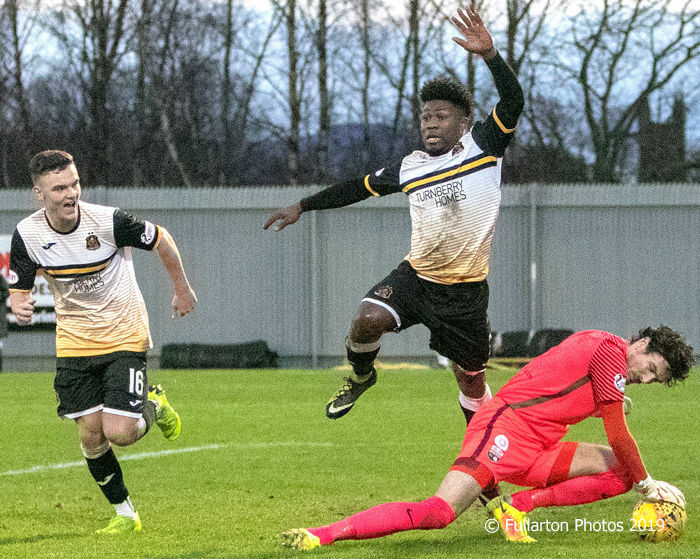 DUMBARTON snatched a draw from the jaws of victory at the C & G Systems Stadium against Montrose — and slipped to second bottom of League One. But there was some consolation for the home fans in the 512 crowd with good debut performances from newly signed on loan defenders Henk Van Schaik from Livingston and David Ferguson from Ayr United, and returns to match action after long injury absences by Craig Barr and keeper Grant Adam. Also pleasing was the form of trialist striker Boris Melingui who scored his side's only goal and was named man of the match. The home side were two minutes away from a victory, but a late penalty for the visitors meant that the game ended with honours even at 1-1. On 82 minutes comeback keeper Adam was replaced in goal by trialist Chris Smith, after going down injured twice in a matter of minutes. Shortly afterwards Sons went into the lead. Ross Forbes sent a free kick into the area and Melingui (pictured) headed it home for 1-0. That left just seven minutes and time added on to secure a vital win. But on 88 minutes Smith committed a foul in the area and the referee pointed to the spot. Martin Rennie converted for Montrose to make it 1-1, and the final whistle blew soon after.